Like Gauguin, Dubuffet started out as an unlikely candidate to be anything at all in the art world. He was born in Le Havre, France in 1901; his father was a prosperous Le Havre wine merchant. Dubuffet tried painting for a while, then gave it up in disgust because he decided he was only imitating his Paris friends, Suzanne Valadon, Raoul Dufy and Fernand Leger. He went back to selling wine, got "a wife, furniture, a maid, a brother-in-law, a car, kids." One day before World War II he started to paint again. His wife left him, and the brother-in-law, too. For the next few years, he worked the back streets of Paris, painting little bistros and corset shops, jazz combos, and a host of men and women in the misery of routine. In 1944 he got his first Paris show. His work took on a special excitement. His philosophy amounted to a sweeping rejection of Europe's cherished art traditions, He became the leader of the Art Brut (raw art) movement, which proposed that the only art worthwhile was spontaneous and that those who are the most spontaneous are savages, lunatics and children. Dubuffet collected the works of mental patients and children to such a large and interesting extent that these works are housed in their own museum in Lausanne, Switzerland. In his own work, he used as his point of departure childrens' scrawls and the art of the insane. He was convinced that "art has much to do with madness". 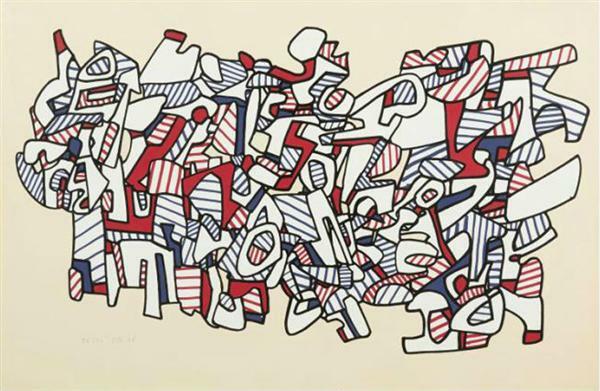 The required view of Dubuffet is that of the artist as noble savage. Agitated by a kind of cosmic giggle, his large energy and abundant talent have conspired to demonstrate that comedy and objectivity can be synonymous. He made the accepted concept of beauty appear banal, and ugliness seem beautiful and powerful, even magical. All graffiti artists are in his debt, whether they know it or not. He often used mixed media such as asphalt, pebbles and glass to enrich his paintings' surface. In the early 1960s after the close of his Paris Circus period, Debuffet invented yet another period, entitled Hourloupe. It was described by a nervous meandering line, a web, into which the human comedy was trapped for scrutiny. He died in 1985. Written and compiled by Jean Ershler Schatz, artist and reearcher from Laguna Woods, California.